“Hey, look at this!” called an excited chimney sweep from downstairs. A couple of weeks earlier, after an extremely long and stressful journey home from Venice (thanks for nothing, French air-traffic controllers), I had lit a fire for a bit of cheer, only to have the living room fill with billowing black smoke. It had been one of those days. I guessed straight away that jackdaws were to blame. There had been a few twigs in the grate when I went to light the fire. They had never tried to nest in this particular chimney before, on account, I assume, of all the smoke that emanates from it throughout the nest-building season. After the smoke finally cleared from the living room, there were no scrabbling sounds or noisy chaks coming down the chimney, so I guessed the birds had either given up on their nesting venture before I returned home, or my abortive attempt at a fire had driven them off. So I booked the chimney sweep and spent the next couple of weeks in chilly, fireless gloom. “This is amazing!” called the chimney sweep. I clomped down the stairs and into the living room. No sign of him, apart from the end of his extendible brush hanging down from the flue into the fireplace. And then I heard the commotion outside. 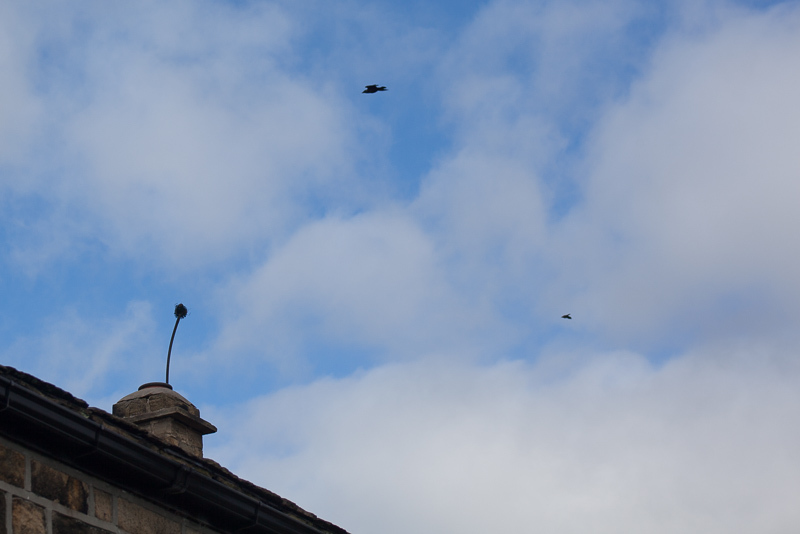 I rushed out into the driveway, to find a bemused chimney sweep starring up at our chimney pot, where the other end of his extendible brush was being attacked by about twenty jackdaws and rooks. They wheeled above the house, taking turns to dive towards the head of the brush and peck menacingly at it, egged on by the chaking and craaing of their colleagues. Like an idiot, it took me a good half-minute to think of rushing back upstairs to get my camera, by which time, all but a few of the birds had left the scene of the outrage. if you see another black bird kicking up a commotion and attacking something, join in! Mobbing is a remarkably effective way of driving away predators—although less effective, it turns out, on chimney sweeps' brushes.